Thomas and Mariah Pisha-Duffly’s newest pop up venture, Gado Gado, explores Thomas’ Chinese and Indonesian heritage through dynamic pop up feasts. 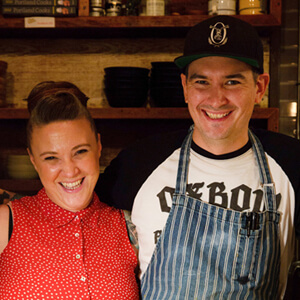 Thomas and Mariah draw inspiration from their travels in Southeast Asia and diverse culinary backgrounds in order to bring this exciting cuisine to the Pacific North West. From late night noodles to sit down family style gatherings, Tom and Mariah enjoy every opportunity to creatively engage with their community through food, beverage, and a damn fine party!